An quick and easy appetizer, that is easy to put together. If you have access to olive mix, it makes this quite easy, as it’s just a matter of layering the meats and cheeses, topping with the olive mix, putting the top back on, and slice away! An easy, easy way to make a New Orleans style olive mix would be to combine chopped olives – green, black, with and without pimentos – and some store bought giardiniera- add a few herbs, garlic, if desired, but I find that is all lost. A little of the giardiniera vinegar and a splash of olive oil, let sit over night for best results. That is basically all it is. There are multiple “recipes” online, but usually, the simplest is the best. My favorite brand, that is locally made and available in the New Orleans area is Boscoli. (Check out the ingredients list. ) 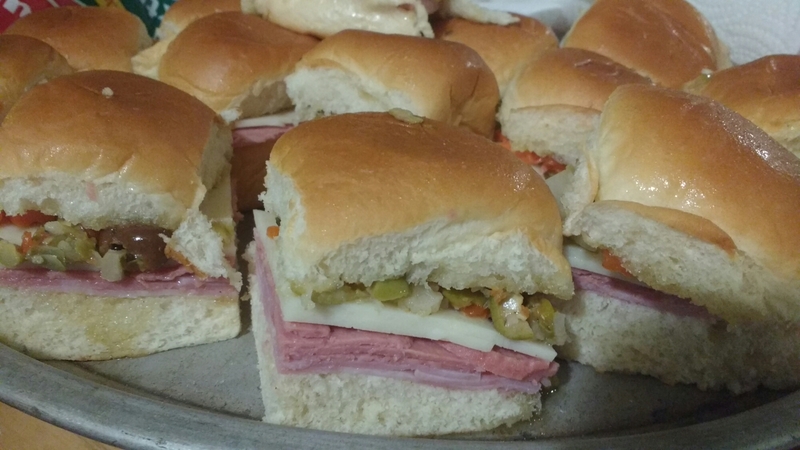 Or, you could also order the original from Central Grocery, the originator of the muffuletta . 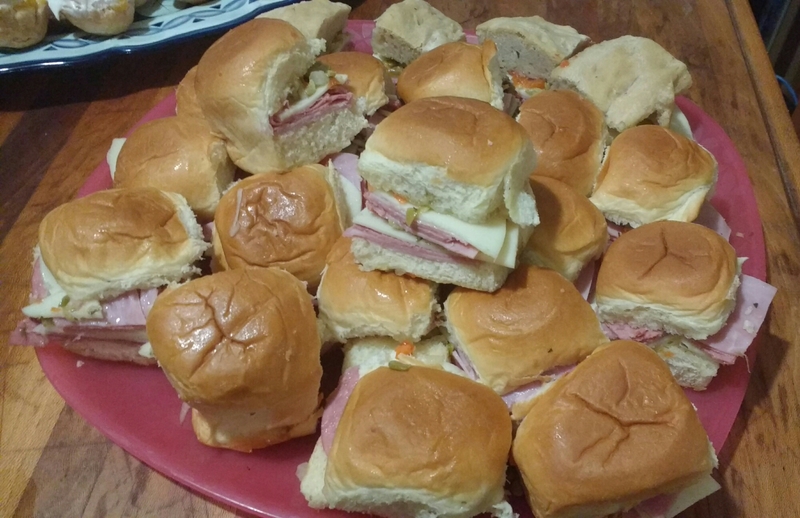 I used King’s Hawaiian rolls, and simply sliced the the whole box of rolls, as if making one huge sandwich. Layered the provolone, ham, mortadelli, and salami and olive mix, put the top layer back on, and then cut the rolls apart with a knife; which is why the meat and cheeses are clean cut. To cut the meat and cheese to make it fit each and every roll? Way too much time, and no one has time for that! The nice thing about muffulettas are that they actually benefit to being made in advance, so that the flavorful oil is soaked in the bread. This is also a good time to enjoy some mortadella or olive loaf in there. Slice open the bread, layer the meats and cheese, top with the olive mix and top. I prefer mine toasted in the oven, covered in foil so the bread doesn’t dry out. I love this sandwich and even more so, your idea of using small buns for it!